Everyone feels and experiences anger at some point. It’s a ubiquitous feeling. Anger is the outcome of certain situations and very few learn to manage it. Mismanaged anger can result in poor decision making and problem solving skills, cause serious problems at work, and can even create permanent wedges in relationships. In order to prevent this, one should be able to manage anger and control it effectively. 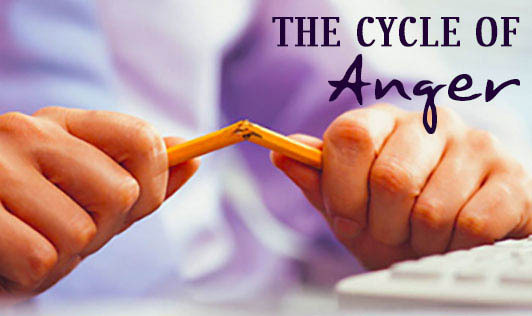 This requires an understanding of the cycle of anger. The trigger phase is when a situation or an event provokes an individual to react. They may be different for everyone. During the trigger phase, an individual experiences threat and the physiological system prepares to respond to it. In this phase, anger starts to appear on the face like widening of the eyes, changes in the size of the pupils, and knotting of the eyebrows. Voice also undergoes a change, with the pitch getting either higher or lower and muscles become tensed. Respiration is faster, the blood pressure rises, and so does the heart rate. The chances of calming down decrease once an individual reaches the escalation phase. The body gears itself up for the crisis ahead. In this phase, the body is ready to act. The fight or flight response sets in and the individual chooses either to save himself/herself from the potential (physical or emotional) danger. Rationality and reasoning reduces to a great extent as the anger instinct takes over. In severe cases, a person may even prove to be a serious danger to himself or to other people. After the action (in the crisis phase), comes the recovery phase. Since anger has mostly been released by now, the body gradually begins to settle back into normal state. The adrenaline surge drops and reasoning begins to set in. Albeit, some kind of inapt intervention may serve as a new trigger and bring back anger. In this phase, a person comes back to their senses and adapts normal ways of behavior. The body also recovers its balance as the heart rate goes down. The individual tries to analyze the event and accordingly experience feelings of guilt, regret, embarrassment or depression. Anger is a powerful emotion. But it should not be confused with aggression. Anger is mostly a healthy emotion, but if managed incorrectly can result in complications and potential harm- either emotional or physical.